Every weekend we dig into the archives. This post by Kent was originally published in May 2014. Our open, innovative economy increasingly craves proximity and extols integration, which allows knowledge to be transferred easily between, within, and across clusters, firms, workers and supporting institutions, thereby enabling the creation of new ideas that fuel even greater economic activity and growth. – Bruce Katz, The Metropolitan Revolution. A while back I took a look at CBD land value and discovered how extreme it is compared to cbd-adjacent property. Taking a cross section look those land values also reveals some interesting anomalies on the western side where land values seems to be compromised. 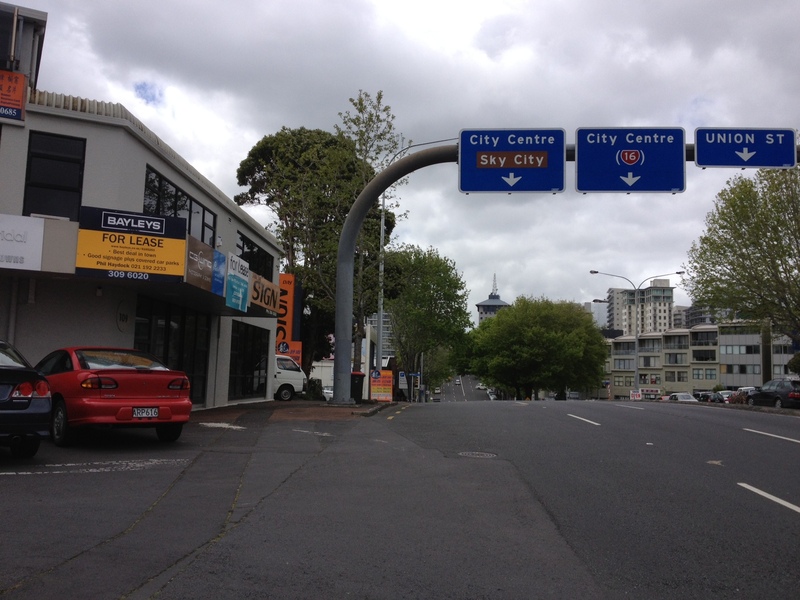 Elevation and historical land use activity were suggested as an explanation, but it is more likely influenced by the motorway-scaled one way systems of Hobson and Nelson Streets which create a barrier to movement and accessibility. The fundamental function of a city is to facilitate exchange- social, economic and cultural. 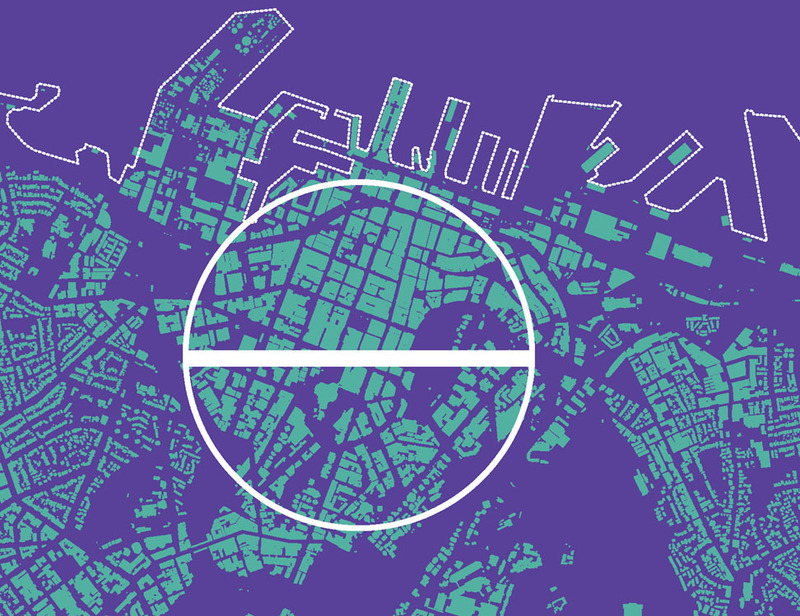 Urban land value is created by accessibility and centrality; simply, how many people can access the site, or inversely what can people access within close proximity from the site. While useful for shaving a few minutes off a commute, streets designed to prioritise vehicular access such as the one-way couplets of Hobson and Nelson Streets destroy urban land value. Here are couple of images from a dystopic tour of the CBD. The prioritisation of automobiles repels human activity. So while it may be easy to access offices and places in the CBD from the motorways, this access comes at a cost. In urban settings automobility limits personal mobility (walking) both by creating repulsive environments (see photos above) and by the spatial requirements of moving and storing cars, resulting for example in having to wait for two minutes to walk across a street. Here is an illustration of the spatial requirements of moving a car through an urban area. To put it another way, the prioritisation of the long distance car trip with motorway-style infrastructure may save time on one trip, these designs severely obstruct other short trips or more spatially efficient PT trips. This returns us to the value of a city- its ability to facilitate exchange (or as some spatial economists obliquely say ‘to minimise transport costs’). 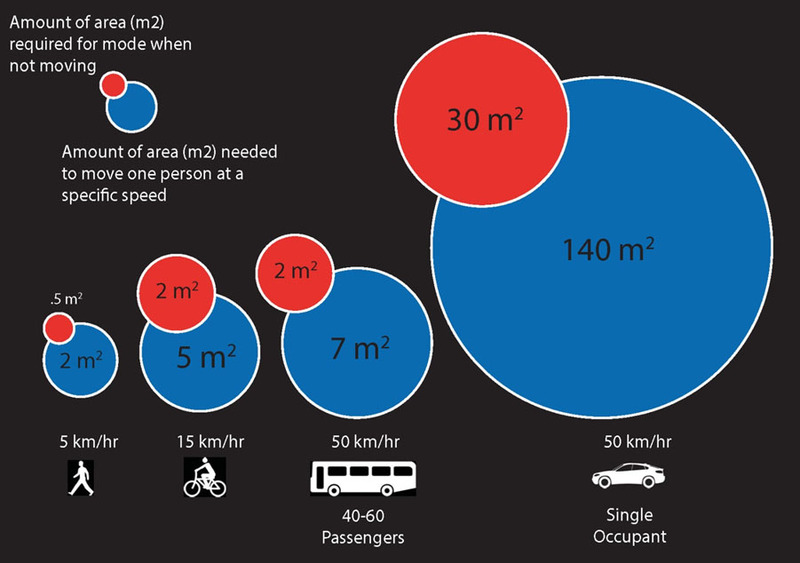 Today we continue plan our transportation systems based upon the objective of minimising motor vehicle delay, but this is seriously flawed, especially in urban contexts. The most valuable trips in urban areas are not the motor vehicle trip, but the ones buried in the ecosystem of city life which go unmeasured. Critically these “trips” are enabled by highly efficient transport modes. These trips enable the phenomenon of cityness – the messy, complex, dense convergence of the physical environment at multiple scales. Increasingly these spatial properties of cities are being recognised for their value in fostering innovation and productivity. In the recent book Metropolitan Revolution, Bruce Katz documents how cities are radically adapting to the new realities of proximity that are required for businesses and cities to compete on the global scale. The hunger for knowledge and the imperative to collaborate has spatial implications. Partners want to be near partners for the simple reason that proximity enables constant interaction and knowledge sharing. …The proximity effect can be staggering: Gerry Carlino has found that the number of patents per capita increase, on average, by 20 to 30 percent for every doubling of employment density, with the greatest increases expected within the most densely populated portions of a metropolitan area. Stuart Rosenthal and William Strange find that intellectual spillovers that drive innovation and employment drop off dramatically as firms and people move more than a mile apart.” At a distance of just over a mile, the power of intellectual ferment to create another new firm or another new job drops to one-tenth or less of what is in closer in. 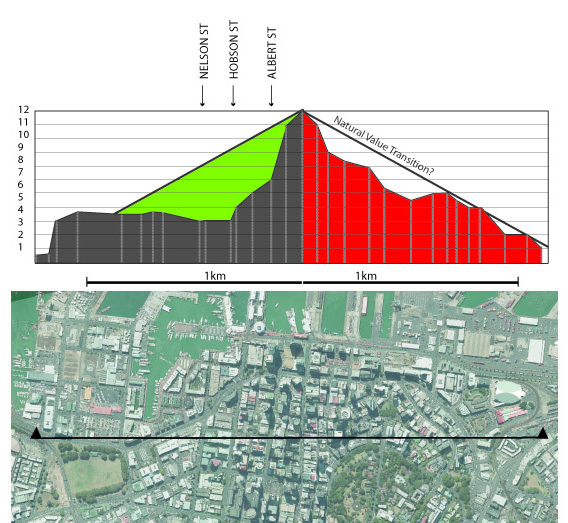 Here is a map of the Auckland CBD showing this mile metric. Coincidentally it fits nicely within the motorway collar. 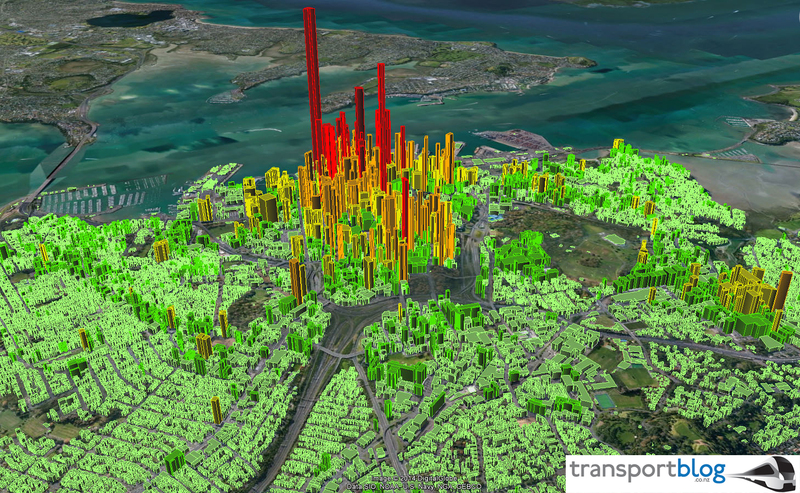 Auckland shown with 1-mile wide circle “Intellectual spillovers …drop off dramatically as firms and people move more than a mile apart.” Bruce Katz. Katz’s bigger point here is that it is not just media companies that require this spatial fix now, but a broader range of knowledge-intensive sectors such as science and technology heavy fields. Lets consider that 750m metric for a moment. This distance generally represents a 10-minute walk. Add a hill, throw in an intersection or two (or just Fanshawe St) and very quickly that employment-dense catchment that firms would pay a premium for is now marginalised. Here is an illustration of 750 meter (radius) catchments across the CBD. Consider if these circles having the depth that is required to support a job dense environment in this economy. Now chip away at these circles with a motorway, a one-way couplet, a two-minute wait at a traffic signal, some hills, and even the water’s edge. What’s left? Here is a more sophisticated version of the first image. I have extended the study area across the motorways. The blocks represent capital value (land value + improvement value) by area. This value has then been extruded using the building footprint in a relative proportion of height (ie. a tower tower 30m is 3X more valuable than a tower of 10m). Auckland’s struggling CBD sand castle. Some things jump out from this image. Like from my original post, the premium for city centre land is impressive. 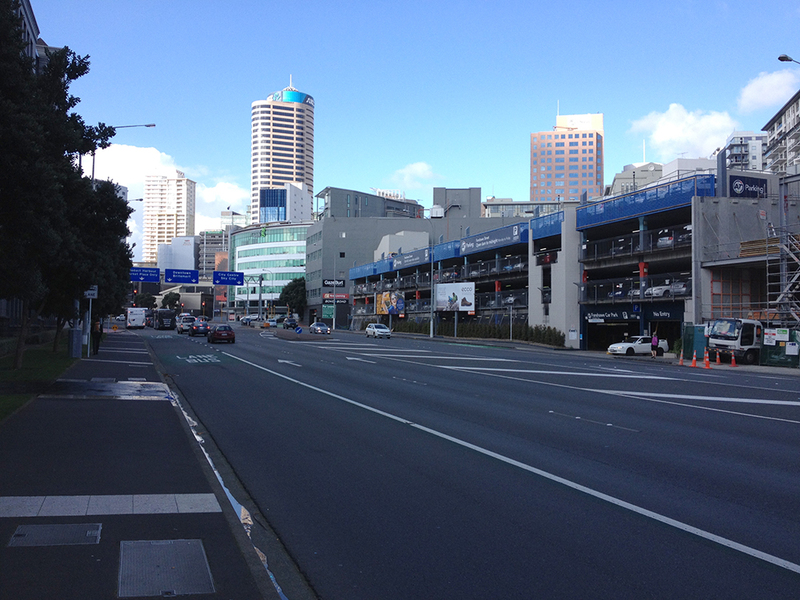 Also, the motorway system seems to radically constrain the cbd like a noose. This also has the effect of concentrating capital values excessively in the very centre (near Queen Street) since this is where the abundant proximity remains. Firms locating on the edge, or cbd-adjacent (outside the motorways) have limited access to the concentration of people in the city centre. As a single fix the CRL has the potential to span the motorways and create “centre of action”-like proximity to places like K Rd, Newmarket and Eden Terrace. In addition to the massive mobility efficiency of underground rail, it will also critically bring a degree of scale to our CBD which is currently chopped into an archipelago by the motorways. 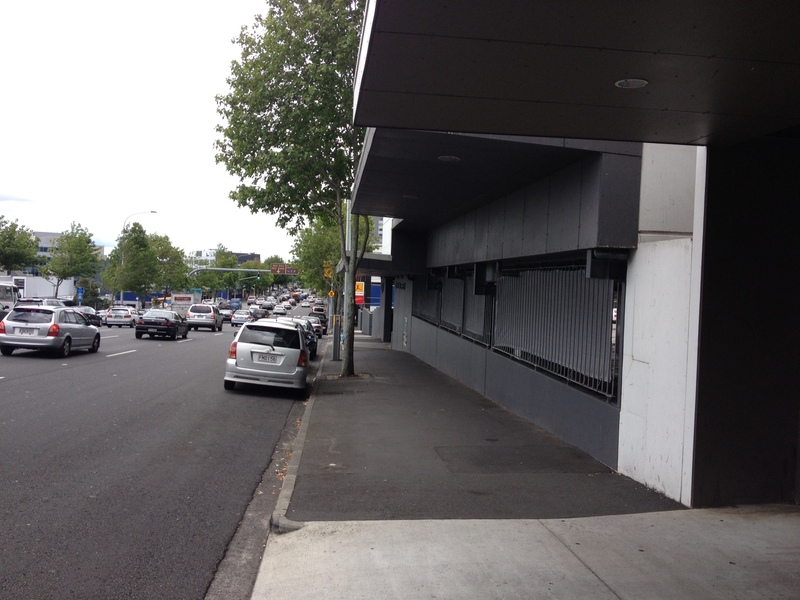 The CRL however, will not address the street-level barriers that repel movement and proximity. This will require a major shift in the way people see the value of the city and recognition that there are real trade offs associated with applying outdated transportation objectives in urban areas. Brilliant paper. Well done Kent. I particularly like the last paragraph that the CRL is not a single fix and yet AT is seemingly progressing with the belief, or hope that it is. While the long awaited roll out of the new networks is helpful where are the changes as you say to make the city a more pleasant place to want to visit, walk around, linger and spend money that sustains the business part of the city? Redevelop spaghetti junction. Remove the mistake. But the other noticeable thing from the last image is The Domain. That’s a really big area in the CBD that in big part doesn’t even accommodate walking, let alone pleasant walking with wide paths suitable for stopping to meet and talk. Local resident support for the Messara report and its recommendation to reduce the number of racecourses is really encouraging. The report’s future map only has Ellerslie remaining in Auckland – I don’t know much about course ownership and control, does this mean Avondale and Alexandra Park would be converted? And now we just need a Messara report for golf courses! Agree about high schools and that they need to just go ahead and fight the stupid court battle about grammar zones. As someone who has worked for a decade in trying to retain the green and recreational spaces we have because they will be needed so much in a more intensified future city, I think you are focusing a bit too much on intensification through using these spaces. Small, dispersed recreation facilities and green spaces within short walks of denser housing is ideal, supporting an active population far more than centralised facilities. Certainly amenities need to be flexible to meet the changing recreational preferences of the population over time, hence conversion of bowling greens to community gardens, etc. The better opportunities for housing are in building mixed use development on carparks, car yards, petrol stations, motorways 🙂 and heavy industrial sites. Completely disagree that smaller sites are better. They have different benefits, challenges and opportunities. One great thing about a large site is that you can build in social amenity, accessible well scaled green space, and non-residential landuse really easily on a single site. Plus, you have no immediate neighbours on most of the site so that the effects of NIMBYism are reduced. 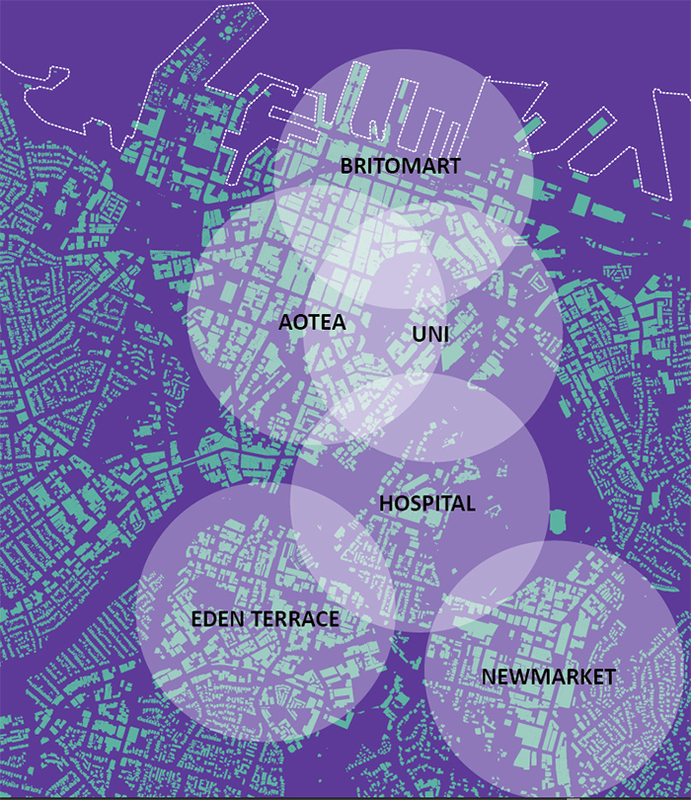 Several large island of well done density, such as Unitec, Alexandra Park, and Avondale will shift public acceptance of density too as more people see that they are pleasant neighbourhoods where there friends live rather than [insert your favourite medium density bogeyman here]. I agree the bigger sites hold a better opportunity for doing things well. I have an issue with selling off the small sites such as the ‘bunch of barely viable 2-3 court tennis clubs’. The recreational purpose of these sites should be able to change to suit the times, but they need to be kept for recreation.